Why can LG dishwasher display the OE error code? You will see these icons on the display if the drain is clogged: the dishwasher can’t drain the water. How to fix the code? Sometimes a system failure causes the error to appear on the display. In order to rule it out, try resetting the icons. Then you need to remove the filter clog. Open the door of the dishwasher tub. Pull out the dish racks. You will see a drain filter at the bottom panel. Unscrew the part from the bottom panel; remove the screen located behind it. Clean and rinse everything under water pressure. You can use a soft brush and some detergent to clean heavy contamination. Also, check the opening behind the filter, there should be no foreign objects. You can avoid this problem if you regularly clean the drain. Experts recommend cleaning once a week or better yet immediately after the washing cycle. Remember to clean the dishes well before loading them into the tub. 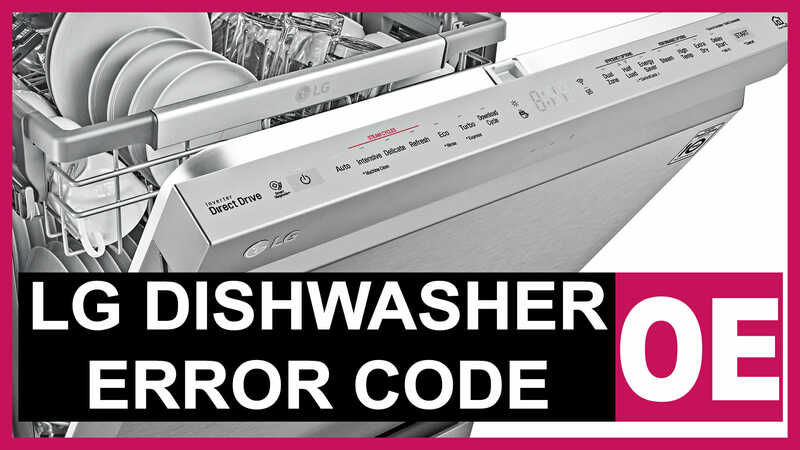 Take care of your appliance, and then you will not see the OE error code on the LG dishwasher display. Sometimes there is a clog in the sewer. In order to troubleshoot the sewer problems, you can call a repairman or cope with them yourself. Add a special powder into the sewer and use a plunger. It is up to you. You also need to clean the drain hose. Do it under water pressure or mechanically (using a brush). It is also important to install the water drain hose properly. If the error appears in the first dishwashing cycle, then the problem is in its improper installation. Remove the screws or release the bottom panel latches. The float sensor may be attached to the reverse side of the bottom panel. Carefully unscrew the mounting bolt and disconnect the wiring. Once you have access to the circulation unit, you will notice the pump fastened to its side. Turn the pump and remove it from the seat. Check the openings for clogs. We recommend you taking pictures or shooting a video of your actions. So it will be easier for you to reassemble the dishwasher. In addition, you can inspect other parts, hoses, and pipes. The failure of the pressure switch may cause the LG dishwasher to display the FE error code. The main task of this LG dishwasher sensor is to control the water level in the device. And if such a part fails, then it is highly probable that the working tub will be overfilled. Or the switch will provide the control board with wrong data, namely: there is no water in the tub. generally, the units are of poor quality, which leads to the short useful life of the pressure switch. The LG dishwasher has a CANCEL & DRAIN option. It drains the tub. It gets activated if you press the control panel buttons DELICATE + DUAL CONTROL and Spray + Half Load simultaneously. Let the dishwasher run for 45 seconds. Then turn it on. The first 45 seconds of any cycle is drain only.